Smoke from widespread fires in Indonesia in the summer and fall of 2015 hung heavily over major urban centers in Southeast Asia, causing adverse health effects for millions of people. The afflicted could not have known that the polluted air they were breathing contained carbon from plants that were alive during the Middle Ages. During the prolonged conflagration, which was triggered by an El Nino-driven drought, scientists collected smoke particles on the campus of the National University of Singapore and sent samples to their colleagues at the University of California, Irvine. UCI's researchers dated the isotopes of the particles' carbon atoms, finding them to have an average age of 800 years. 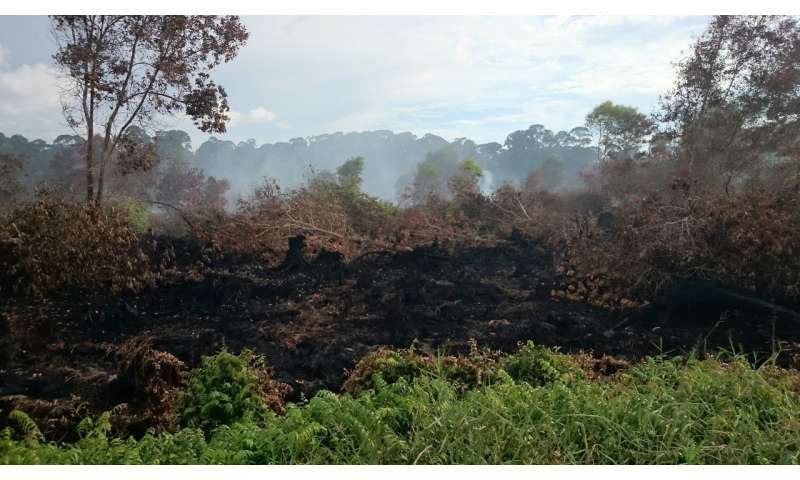 Combining this analysis with atmospheric modeling of the movement of smoke plumes from the fall 2015, the team sleuthed out the source of the hazardous cloud: smoldering peat on the islands of Borneo and Sumatra. The findings were published today in Proceedings of the National Academy of Sciences. "Our research shows that almost all of the smoke emissions originated from the burning of Holocene-aged peat," said first author Elizabeth Wiggins, a postdoctoral research fellow at NASA's Langley Research Center who led the study as a Ph.D. candidate in Earth system science at UCI, graduating in 2018. "Although this peat has functioned as a terrestrial carbon storage reservoir over the last several thousand years, it is now a significant source of carbon to the atmosphere." The scientists' work provides independent confirmation that Indonesian peats were the flashpoint of the blazes, highlighting the role of humans in the environmental catastrophe. "These are the first direct measurements showing the smoke originated from combustion of peat layers that are hundreds to thousands of years old," said study co-author James Randerson, UCI's Ralph J. & Carol M. Cicerone Chair in Earth System Science. "Farmers drain the peats because waterlogged soils are bad for growing oil palms and other crops, and they seek to burn off surface layers to get to the mineral soil below." Indonesia's peatlands, which hold as much carbon as all of the living biomass of the Amazon rainforest, according to Randerson, had been left alone for millennia, serving mainly as habitat for rare species such as orangutans and Sumatran tigers. In recent decades, expansion of agriculture in remote southern Borneo and uninhabited parts of Sumatra has led to the degradation of these critically important ecosystems. "This was all human-driven," Randerson said. "The fires help a small part of the population, but the costs for people far away in cities such as Singapore and Kuala Lumpur are enormous." Co-author Claudia Czimczik, UCI associate professor of Earth system science, said that the peatlands are "doing us a favor" if left unperturbed. "These peats, in general, perform a lot of important services for people in the region and also for the climate," she said. "They store carbon that otherwise would be in the atmosphere, and they can contain a lot of water during excess rainfall and help prevent flooding." Czimczik also pointed to the importance of finding better ways to manage these ecosystems. "We need to find more sustainable agricultural solutions in which we preserve tropical forests and peatlands to provide all of these benefits while at the same time enhancing food security."